PRETTY LITTLE THINGS: Hello, cupcake! What can be cuter than a pack of fluffy little puppies? 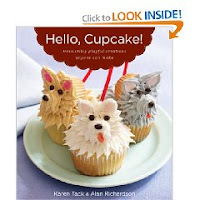 Why, cupcake puppies, of course! This was the image that got me into buying the "Hello Cupcake!" book some weeks ago, with the luring subtitle "...playful creations anyone can make". Living in Italy I could be not further away from canned frosting, rainbow food colors and marshmallow fluff requested for the "easy creations" even if I lived on the moon. The standard italian grocery shop doesn't carry any of the above and my secret stash of food colors brought way back from Germany features the 3 basics of red, blue and yellow. So, you started a blog - and now?